Ending homelessness can be done, says Rodney Stockment, the city of Indianapolis’ senior strategy director for homelessness, adding that collaboration and supportive services are imperative to its eradication. 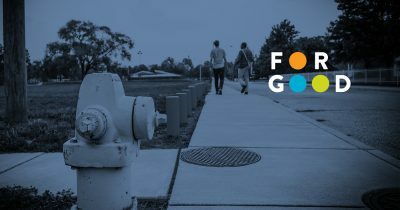 In this month’s episode of For Good, hear from Rodney, representatives from Horizon House, Partners in Housing and the Coalition for Homelessness Intervention and Prevention (CHIP) about the realities of homelessness in Marion County and the collaborative efforts to end it. It’s a heart-breaking statistic much more than numbers. 12000 people a year are homeless in Marion County. Some live in shelters or on the couches of friends and some on the streets. And their journeys to homelessness are each complex. Hello, I’m Angela Cain, your host for this special episode of For Good. We’ll explore what some community leaders are doing to end homelessness and what you can do to help. Her name is Angela, and she’s one of the 12000 faces of homelessness in Indianapolis. She’s a mother who has faced traumatic life events that started in her teens. ANGELA: When I was younger, I had … I got raped. I got raped twice. One age at 16, and then in my 20’s. So, I was dealing with a lot of things. The repercussions of that trauma, plus a devastating divorce where Angela lost custody of her daughter intensified her stress. She turned to drugs. ANGELA: I believe it was like self-medication, trying to medicate myself, you know, dealing with all of the trauma. You know, to numb myself. Angela lived on the Indianapolis streets alone. ANGELA: It’s real tough. You gotta watch your back. For me, I really couldn’t trust anyone, especially being a female. It was a bad experience. I didn’t know where I was gonna stay. I didn’t know whether I gonna eat or not for that day. Angela’s life is different today. And you will see how. But first, a deeper dive into what homelessness looks like in our community. Twice as many men are homeless than women and one in five are youth. More than 1,000 people experiencing homelessness are families. ALAN WITCHEY: Our family shelters are full, so every night, there are people that are turned away. Lots of families that are turned away. It’s a very big need in our community. Alan Witchey is the executive director of CHIP, the coalition for homelessness intervention and prevention in Indianapolis. He says the root causes of homelessness are varied. ALAN WITCHEY: One in five people end up homeless because of domestic violence. There are quite a number of people, at least a third, that have chronic mental health issues and addictions. Eviction is very high. Many people have a job they lose, income, or they have some kind of a bill that comes along, like a medical bill or something that they can no longer pay. We have a number of youth that have to escape bad situations at home or they’re actually asked to leave their homes by their parents because maybe they’re LGBTQ and their parents don’t agree with that. And some of the others facing homelessness, veterans, teens leaving foster care, and people with low-wage jobs who can’t find safe, affordable housing. Melissa Burgess sees affordable housing as a major challenge. She’s the program manager at the Horizon House near downtown Indianapolis, which serves 4000 experiencing homelessness a year. MELISSA BURGESS: If you receive social security or you’re making $7.50 an hour, how would you be able to afford a five, six hundred dollar apartment on top of utilities and basic needs, transportation, hygiene, food? The vast majority of people are not chronically homeless, but they are experiencing temporary displacement because of a devastating incident in their lives. ALAN WITCHEY: It’s a very traumatic experience for them. They are trying to get out of homelessness. They’re trying to get their lives back in order. And we know that about 80% of them, every year, have not been homeless before. And there are many agencies combining efforts to end homelessness here. Scott Armstrong is the executive director of Partners in Housing. SCOTT ARMSTRONG: We are, at our heart, an organization that houses people permanently that are in most need of stable place to live. Partners in Housing often uses federal funding to create affordable housing in Marion County. SCOTT ARMSTRONG: Everybody who lives with us meets a federal definition of at-risk for homelessness. And about half the people have come to us directly from having experienced chronic homelessness. We don’t check credit, because we don’t care. We don’t check prior evictions, because we don’t care. We care about the future, right. We’re a second chance. We’re a third chance. They help people like Angela. ANGELA: Having a roof over my head means that … I can survive. But I know I have to do my part. And I just think it’s such a blessing to have this place. Angela’s story of homelessness has changed. She has an apartment today through Partners in Housing. She’s no longer on the streets. And she’s been drug-free for three years. ANGELA: I just got tired. And things that keep me clean is that I remember the pain. I remember the pain … of just using, everything that you lose. I don’t want to go back down that road again. Having a home does give me hope. I feel alive again. I feel like a person again, you know. CHIP is leading the charge to end homelessness in Marion County, serving as an intermediary. CHIP hosts collaborative meetings and conversations like this one that took place with a variety of community leaders. ALAN: We try to move them to stable and safe housing. The goal is to have collective impact. ALAN WITCHEY: For the entire community, though, it involves the city of Indianapolis, the non-profit sector, the business sector, the faith-based sector, individuals, people who are experiencing homelessness. It is about, how do we bring together groups of people and businesses and entities to try to move the needle on ending homelessness? Alan Witchey says the strategies include a better crisis response plan for shelters, more housing, and more wrap-around services, such as connections for the homeless to education, mental health counseling and financial coaching. Rodney Stockman is the senior strategy director for homelessness in Mayor Hogsett’s office. RODNEY STOCKMAN: What’s really driving change is, starting in 2010, we started talking more about what’s called Housing First. The idea of Housing First is that you don’t need to be made ready for housing, you can get into housing quickly and have the service necessary to stay housed. With families the real new thing is called rapid re-housing. The idea is to keep people from being homeless for a long period of time and get them rapidly back into housing. It’s a program that’s really gaining popularity around the country. Marion County also needs permanent supportive housing, with long-term wrap-around services that help people stay in their homes. RODNEY STOCKMAN: So, having a home available and having services around them to keep them housed is, really, I think the answer to homelessness. And in 2017, Mayor Joe Hogsett challenged the community to create 400 new and existing housing units for the homeless in the next three years. RODNEY STOCKMAN: I think the Mayor is motivated by both good public policy, but also that homelessness is not acceptable in this country. We’re not going to keep people from having a housing crisis, but what we can do is build an infrastructure around them. So, when someone in Indianapolis has a housing crisis, they’re either prevented from being homeless or if they become homeless, they’re re-housed within 30 days. To me, that’s success. Stockman says other cities are succeeding with that plan, and Indianapolis can too. RODNEY STOCKMAN: Around the country, you know, homelessness, we were seeing real proven results. This isn’t like a theory any more. The things are happening … and there’s positive results. I think if we got together and worked well together, we can solve it. They’re all working together to meet the needs of the homeless. Horizon House is a multi-service day center. MELISSA BURGESS: I just always want to emphasize that people are people. They’re just like you and me. People deserve dignity and respect and to be treated with kindness. Anybody can experience homelessness. The reality is, most people are one paycheck away. January Jeter, clinical supervisor at Horizon House, and all the staff there, call the homeless their neighbors. The agency provides some relief from their daily challenges, especially for those living outside. JANUARY JETER: When it rains, when it snows, everything you own is soaking wet. And the idea of it drying is just … that’s … it’s just not gonna happen. Just trash, just not being able to have enough food, not being able to store things, so you not only have the elements, but you have insects, rodents. There’s just no reprieve from anything. But Melissa Burgess says that’s what Horizon House tries to offer, a reprieve. MELISSA BURGESS: They access the showers. They access the laundry. They access the case-management. They access our employment program. They access our medical clinics. So, they’re engaged and on the journey to ending their homelessness. Richard Martin, living on the streets for more than a year, is touched by the dignity Horizon House gives him. RICHARD MARTIN: When you’re homeless, it seems like you’re out there all by yourself, no one cares, no one has time for you. But, when you come to the Horizon House, everybody’s treated the same. It inspires me to do better. And, Horizon House trains 70 professional street outreach workers from 22 different organizations, to help people experiencing homelessness. They serve them six days a week. MELISSA BURGESS: Everything that we do in-house is what we take out to the streets. So, we have physicians and nurses and um, social workers, the VA. But even with so much great work serving the homeless in Marion County, CHIP’s Alan Witchey says our city still faces challenges. ALAN WITCHEY: Our local programs are doing a phenomenal job. The biggest problem is just the lack of resources that a number of people coming in that are experiencing homelessness just out-paces the actual resources that we have. Witchey and others say Marion County could use more federal funding, rental subsidies, more public and private donors. But what brings them hope? SCOTT ARMSTRONG: I think the Mayor’s focus on it should give everybody a lot of hope. RODNEY STOCKMAN: The chief elected official in the county is actually really talking about the issue and really diving into it. I think you can’t underestimate how important that is. And they all urge the community to get involved, volunteer, or donate. ALAN WITCHEY: It’s better to give money to an organization or program, because they can use the money effectively to get people off the streets directly. Oftentimes, if you give money to somebody on the street, and let’s say they use that money to buy food, they’re still going to be hungry the next day. CHIP has a street-reach donation link on its website, or there are other homeless service agencies you can support. And Horizon Houses urges you to treat the homeless respectfully. MELISSA BURGESS: They’re being ignored or over-looked. And as a human, that’s a very painful and isolating feeling. But if we ask the question, eye contact, a smile, a hello, goes a long way. Mindy Brown, a CICF ambassador who volunteered to interview some of the people experiencing homelessness says, at the heart of it, they just want relief. MINDY BROWN: They want peace. Just some peace, so they don’t have to worry about every single thing for just a minute. I, I think that they really want someone to listen to them. They want someone to hear their story. And they want to hear other people’s stories, too. But sometimes it’s hard to connect with other people when you feel marginalized. ALAN WITCHEY: People think that if I turn my back on a person who’s struggling or someone who’s homeless, it doesn’t affect me, because I’m doing fine, right? But the truth is, it impacts the economic growth and equality in our community. This is a large community issue and we all have to own it. If we all own it, we can solve this problem. But it can’t be done if just a few of us care about it. SCOTT ARMSTRONG: They’re our brothers and sisters, and they’re living outside and they’re facing incredible trauma at all times. And you can help change their lives. MINDY BROWN: Seeing people who have been chronically homeless for years finally get that key to turn the knob to their apartment and have just this safety net of a roof and a door that locks so that nobody can hurt them, that’s power. That’s power right there. Learn more about CICF’s commitment to ending homelessness and the organizations mentioned in this episode at CICF.org. There, you’ll also find more information about how CICF is working to make Central Indiana a community where every individual has the opportunity to reach their full potential, no matter their place, race, or identity. I’m Angela Cain. I hope you’ve enjoyed this special episode of For Good. We are Central Indiana Community Foundation. And you’ve been listening to For Good. If you liked what you heard today, we hope you’ll subscribe to For Good on your favorite podcast app. And while you’re there, don’t forget to leave us a review. Join us next month for more stories about passion, purpose, and progress in Central Indiana. For Good is brought to you by Central Indiana Community Foundation in partnership with WFYI Public Media. To learn more about how CICF is changing our corner of the world for the better, visit CICF.org. Thank you for listening. Suggestion – Please consider posting transcripts of podcasts for those who are hearing impaired. Thank you, Katie! We are actually working on transcribing our podcast episodes and will have each page updated soon.